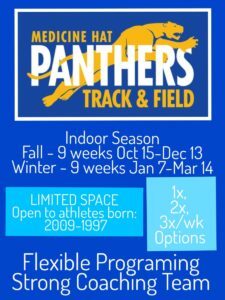 Medicine Hat Panthers offers an Indoor training season at the Family Leisure Center Track. 2016/2017 – 30+ athletes training. 2017/2018 – 50+ athletes training. Indoor season begins mid October, after the cross country season. Indoor Throwing program and Indoor HURDLES are part of our Indoor Track program. Join a program focused on athletic excellence, long term development and positive athletic experience.